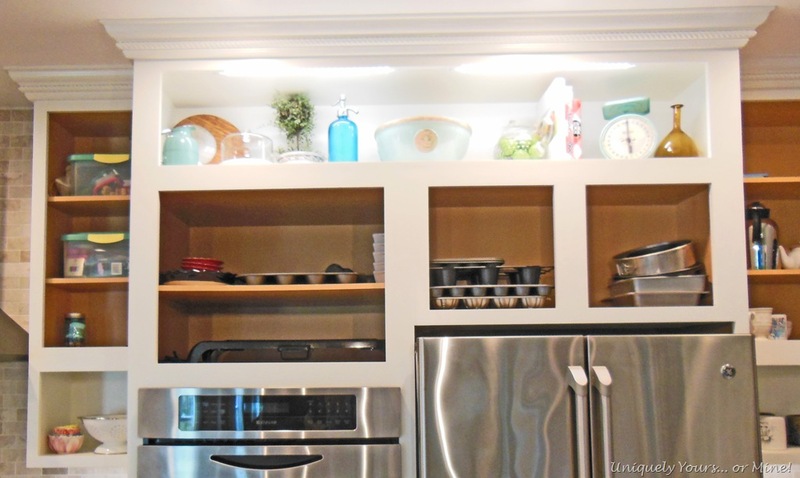 My Newly Raised and Organized Kitchen Cabinets – Uniquely Yours… or Mine! This setup works extremely well for the way we want our kitchen to function! 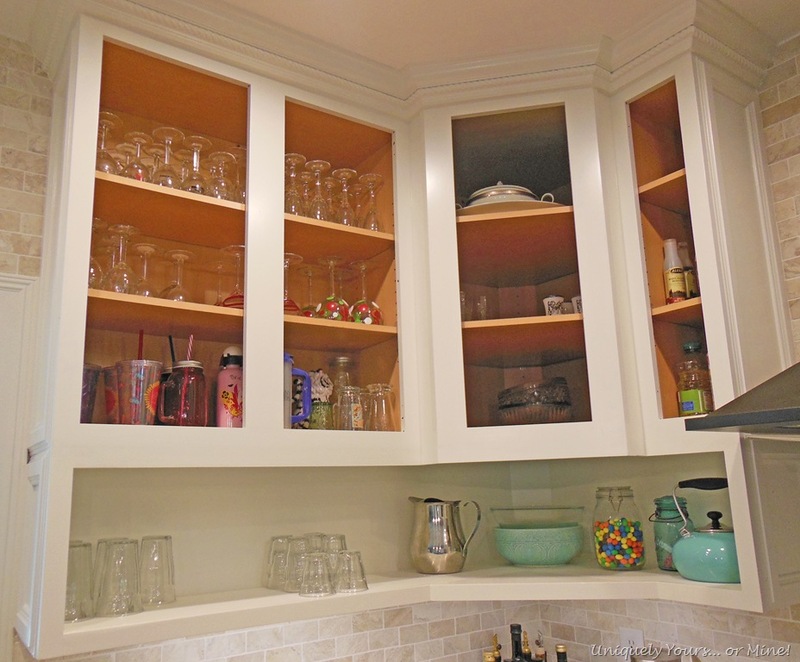 The everyday dishes and glasses are in the open shelving area where they are quickly and easily put away and retrieved. 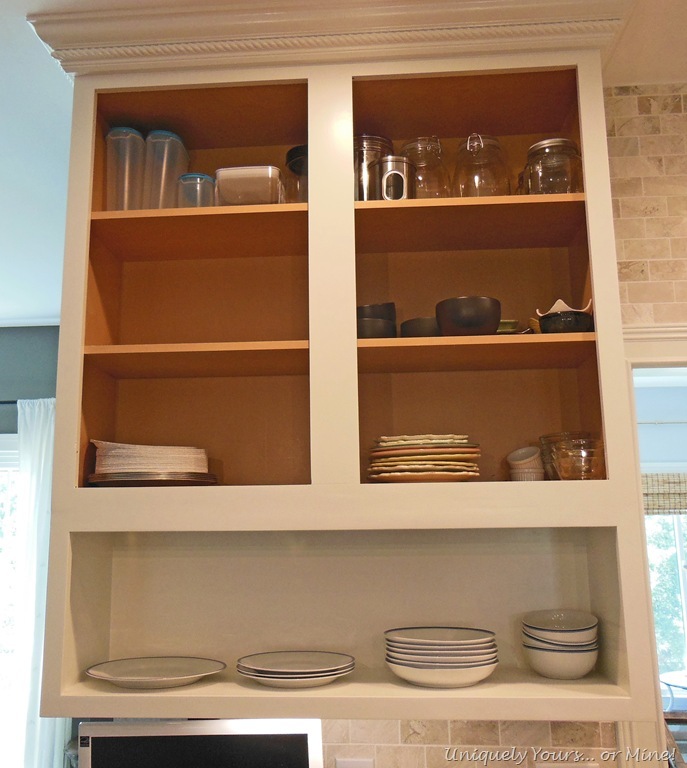 The original raised cabinets are now setup for basically anything that doesn’t fall into the everyday category. However my 5’5” frame can only reach the first shelf in the old cabinets now so this is the main issue that was taken into consideration when I was re-organizing the shelves. Anyway, you get the point… I think I had about 15 line items that I needed to deal with and rather than start to randomly put the items away and then decide I needed to move them or that I forgot something I created a very crude cabinet diagram and worked on placement of the items by numbering each line item and then placing that number on the cabinet they were to go in. It took a little more upfront time, but when I went to put everything away the job went very smoothly. Just some of our many, many wineglasses… also all of our china fit on the top 2 corner cabinet shelves, you know the shelves you always loose stuff in anyway!!! 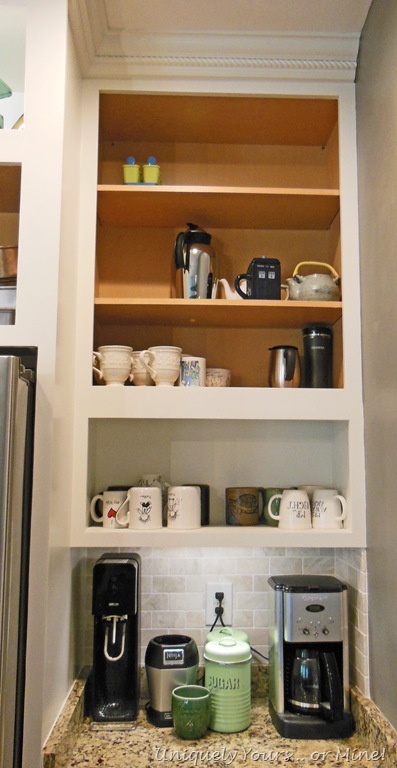 This entire area (top and bottom cabinets) is dedicated to drinks, coffee, soda stream, tea etc. 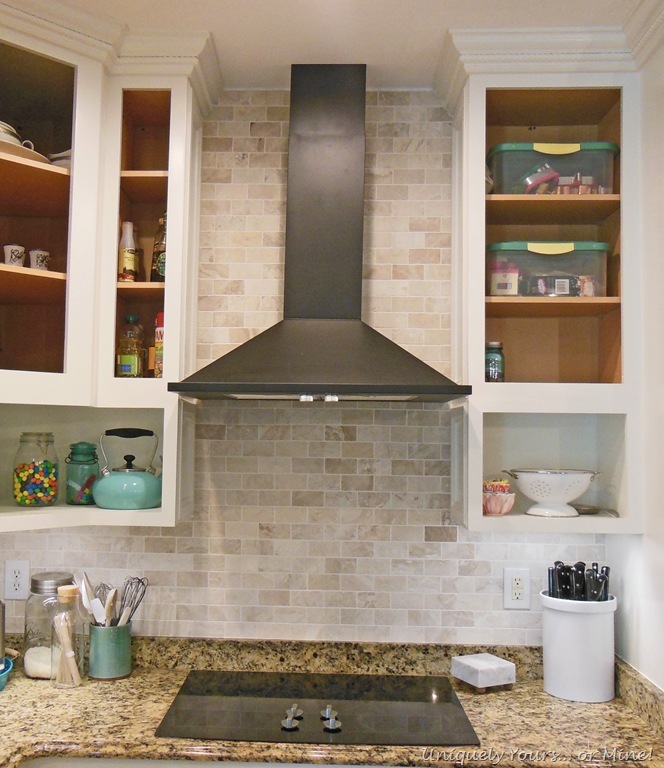 And look we even have the new range hood installed! 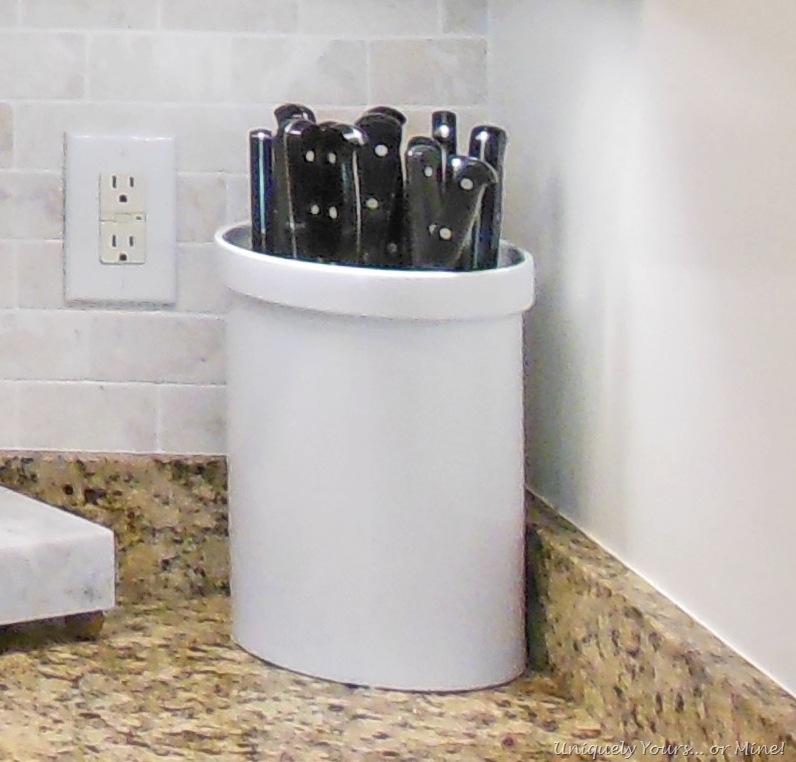 I can’t even tell you how much I love my new ceramic knife holder from Williams & Sonoma… it is super cool with its Kapoosh insert and I think it looks way better than the traditional wood knife block! Well come to find out you can just replace the glass, which my hubby and I did as it is totally a DIY job. Yes, I would have LOVED to have purchased a new top, but finding one that fit the exact dimensions of the granite opening proved to be impossible very difficult. 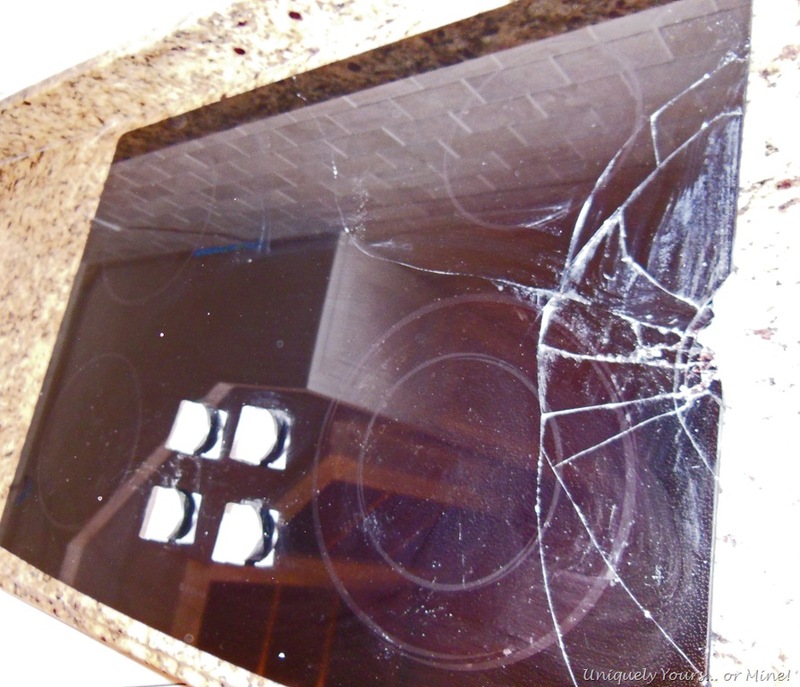 The Jenn-Air glass replacement top I bought online and it cost just a tad over $300, about 1/4 of what I would have had to spend to replace it. I organized the cabinets based more on how often I would need to use the item more so then where I would use it. So for example all of my china and extra wine glasses went way up on the uppermost shelves. Where it would make sense for most people to have their casserole dishes near the oven (where ours were originally) I put ours in one of the base cabinets near the island because we use them quite frequently. I still have quite a few empty shelves, but everything is put away and I have only had to get the step stool out once in 3 weeks so I think the setup is working great so far! As far as finishing the kitchen I just started spray painting the cabinet doors so once done the kitchen will be finished… whew hew!!! 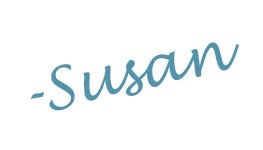 I took a few weeks off, some due to weather, but quite a bit due to procrastination on my part… but I’m getting it done now and if I never have to paint another set of kitchen cabinets I will consider myself a lucky girl!! Previous Post: Kitchen progress, looking good so far! Pingback: Our DIY Kitchen Remodel | Uniquely Yours... or Mine!